Geordie five-piece Bitter Sweet Hearts fuse of rock, soul and blues, all with a raw energy and passion. They next play Consett Festival on the 5th of June. We are Bitter Sweet Hearts, a 5 piece alt rock band from Prudhoe, Northumberland. 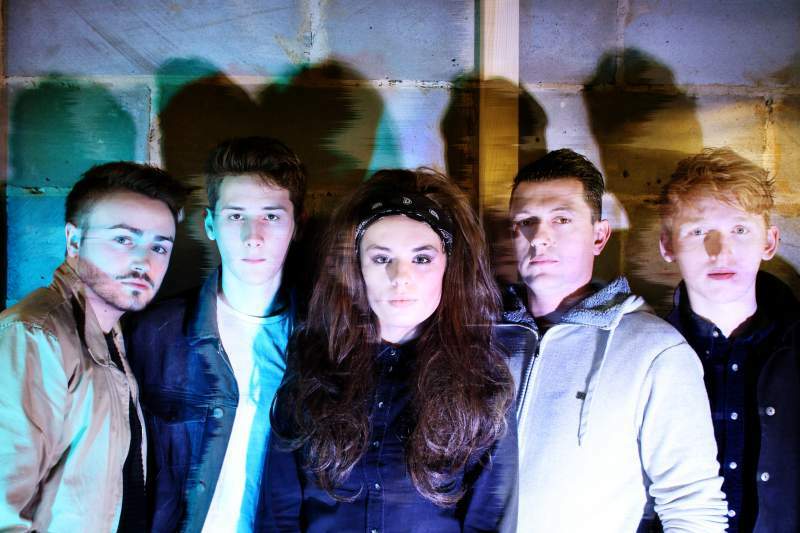 We have two lead vocalists (Chris Armstrong and Samantha Lavery, better known as SJ), bass (James Grant), drums (Cameron Bruce) and a guitarist (Jack Bell). We were all brought up from a very young age, submerged in a musical environment. All of our parents are really into music which was played throughout our childhoods. Our guitarist Jack has home videos of himself dancing to Motorhead in his nappies and then at the age of 6 he was picking up a guitar, so we’ve always been interested in music. I suppose the pivotal point in which we started creating music was when Cameron (drummer) and Jack (guitarist) started jamming in high school and they realised that they had some unbeknown musical synergy. They knew it’d be daft if they didn’t explore this new found chemistry further. Collectively as a band we have an extremely vast array of music tastes with a lot of cross over. We like anything from Bruno Mars to Nirvana to Hendrix to Snoop Dogg. It isn’t specifically artists that inspire our music however, more a single song or section of it. For example if we like a certain motif, effect or technique we hear in a track, that solely has the power to inspire a chain reaction of pinballing ideas that we’ll obsess over until we’ve written a song. Tricky one, at all of our gigs we always feel like the ugly duckling. We love writing songs with a really full, spacious sound that develops and progresses throughout the track. Usually our verses have some ambience and fragility about them, until at least, the choruses get out their loungers and slap you in the face with some dirty, driving ballad. We’re ardent songwriters who want to make every song we write more unique than both the previous song or music of other artists. In summary I would say we’re like Ben Howard and Alt-J’s love child crossed with Radiohead and the Chilli Peppers…lets just say it was a hell of a night when we were conceived. We’ve been gigging for just over a year with our current line-up and this has allowed us to play in venues and festivals throughout the North East. Due to this we’ve met some incredible people whether they be fans, promoters, sound engineers etc. In fact Little Comets’ bassist Matt Hall even joined us in the studio whilst recording our EP and it was fantastic gaining his input. After the release of the EP we’re aiming to do more inner city gigs and establish ourselves even further into the Newcastle music scene. Tell us a bit about your live performances. People always comment on our chemistry as a band. A few weeks ago we played at the Tavern in Blyth and a man approached us after our set. He told us that he’s been watching bands play that venue for years and he has never seen a band with as much chemistry and stage presence as us. Having two lead vocalists really helps our performance as it allows so much interaction on stage and makes our performances that much more dynamic. We’re most definitely a band best suited on stage than in a studio. The whole formation of Bitter Sweet Hearts was a challenge to be honest. Back in 2013 Jack (guitarist) and Cameron (drummer) were playing in the final of the Soundwave Music Competition on the main stage of O2 Academy, Newcastle in a different band; however their singer moved to Australia a month before they were due to play. With this being their biggest gig to date they didn’t want to pass up the opportunity. So Jack asked Chris if he would sing for them, and thank God he said yes, forming Bitter Sweet Hearts. SJ won the competition. We started writing some original tracks for her and over time we grew closer and decided it would make sense if she joined the band. A year later James joined us and that’s how it’s been a happy family ever since…although SJ definitely wears the pants. It all depends on the success of the EP but we are ready and willing to promote it as much as we can. We have a few potential festival gigs lined up this summer which will be great for promotion. We’ve also got an acoustic live session due to be filmed with Spotlight Music, which we shall be releasing online. We’ll be playing some of our newest tracks in this session. But besides that we just want to continue writing, developing our sound and playing live because being on stage and playing our own stuff is ultimately what we fell in love with!